Lately I've been upping the Matcha content in my daily routine. While I'd been adding it to my smoothies and making face masks out of it for years, I only consumed it as a drink a couple times a month. My boyfriend says I'm not a big coffee drinker, but I still have about one cup a day, which can leave my tummy feeling crummy, dehydrate me, and stress the sh** out of my adrenal glands. So, by saying "no thank you" to coffee, I'm actually saying "yes please," to a healthier and less stressful me. I feel better when I drink Matcha! Plus its got tons of benefits to boot. I've come to learn that there isn't such a thing as "perfect health," so I don't make it a goal. My goal is to become more in-tune with the cycles of my own unique body every day, and cultivate a positive relationship with it by listening to its needs. Matcha is pretty damn hot right now, and there can be a lot of options to choose from. I buy mine in bulk, and it's also organic. I mean, who wants to steep pesticides if they can avoid it, right? Not me. If you don't have access to Matcha in bulk, opt for some that's packaged in glass or metal instead of plastic. Or, maybe your local coffee shop buys it in bulk and would be willing to sell you some. Ya never know unless you ask. Matcha is a high quality powdered green tea that has been consumed in both Japan and China for centuries. Most matcha is shade grown to increase chlorophyll content, then harvested, air dried and stone ground into a fine powder. There are different grades of matcha. Matcha powdered tea leaves for drinking are vibrant green in color and harvested from the top of the plant . It can have a distinct sweet earthy and somewhat grassy (sounds bad, but it's not) flavor. Matcha for cooking is often made from the more mature leaves of the plant and can taste somewhat astringent. Measure out matcha and press through a fine mesh strainer into a blender or glass bowl. I like to blend mine to make it extra frothy and delish. I acually don't own an authentic matcha whisk ( I've only seen them packaged in plastic). Add the boiling water or hot milk and coconut oil. Add the ashwagandha, maca, cinnamon, and any other ingredients you desire (1/2 tsp. of Cordycep mushrooms would be an excellent addition)! Blend everything together on medium for about 2 minutes. If not using a blender, whisk until frothy. Pour into your favorite mug, mason jar, or thermos. Enjoy! Matcha mug made by me and glazed/fired by my amazing mom. As you can see, there are so many possible ways to be creative with your matcha drink. If I'm feeling like I want a little more sweetness, I add a couple teaspoons of maple syrup and maybe even a dash of cayenne and cardamon. Hot Tip: If you do choose to use a milk alternative instead of water or a combo of both, I suggest trying to make them at home. Coconut, almond, hemp, and cashew milk are super easy to whip up, and thus you refuse the plastic, waxed, or aseptic containers that will not or cannot be recycled. Ashwagandha. This is one of my all times favorite Ayuverdic adaptongenic herbs. Native to India, it has been used there for over 4,000 years. Ashwagandha has incredibly restorative properties and translates to something like, "To give strength like a horse." It can be taken in the morning or in the evening to improve cortisol levels, supporting the body to cope and deal with stress, which ultimately conserves energy. It can calm the mind, balance hormones (this is a BIG one for me), promote vitality, improve physical endurance, rejuvenate the immune and nervous system, help balance sleep patterns, and support memory and overall well being. I take this herb daily. Maca Powder. Maca powder is made from the adaptogenic maca root (part of the brassica family), which has been cultivated since the Inca Empire in the Peruvian Andes. Maca promotes energy and vitality. It also supports healthy libido, healthy mood, and can help balance hormones. Coconut Oil. I'm sure you've heard of bulletproof coffee? Well this is sort of bulletproof matcha because of the coconut oil edition. 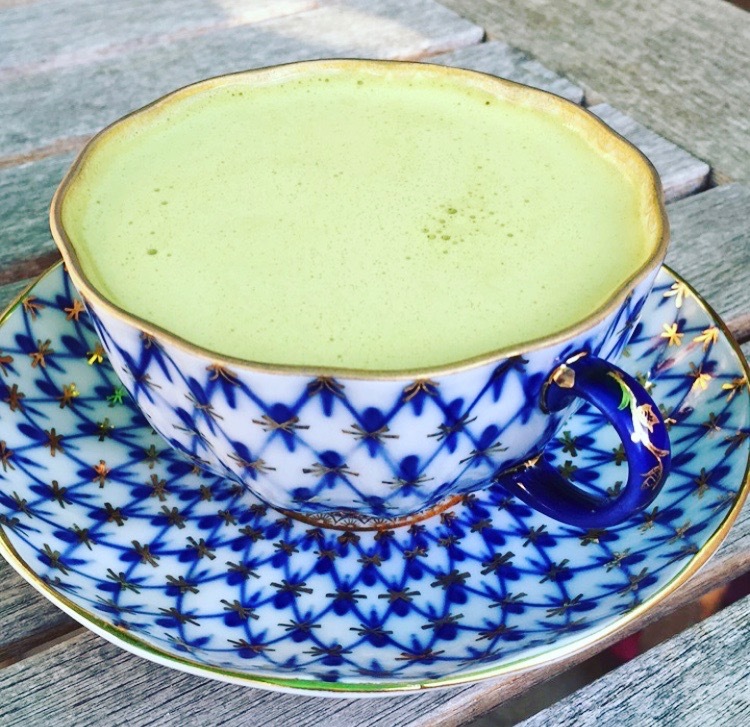 Bulletproof matcha can help support brain function, amplify energy, and may even boost fat burning. Coconut oil is high in what I like to call "good" saturated fat. It also has anti-inflammatory properties, contains Vitamin E & K, a small amount of Omega-6 essential fatty acids, and provides amazing skin benefits. Cinnamon. Cinnamon has such a unique smell and flavor, and it's loaded with antioxidant capabilities. It can support blood sugar levels, digestion, immunity, and has anti-inflammatory and heart protecting properties. Like I tell my boyfriend, "We're a perfect matcha. I love you so matcha." Just kidding.